and 1 pkg of fudge striped cookies crumbled! Here is a favorite of mine. The lime/honey "sauce" ties together any fruit concoction you come up with, but I have used blueberries, pineapple, strawberries, red grapes, and watermelon in the past because it looks so pretty. For a special presentation cut watermelon into 3 or 4 inch triangles, about 1/2 inch thick. Place triangles (points facing out) around the edge of a large platter, stacking into 3 or 4 layers to form a many pointed star. Place the fruit salad in the center. Mix honey, limeade concentrate, and poppy seeds in large bowl. Spread 3-5 tablespoons sugar evenly in a large skillet. Heat on medium until the sugar carmelizes. (This will take longer than you think so be patient!) Once sugar is a golden brown carmel stir in walnuts. Pour onto wax paper and cool. Once cooled, break into small pieces. Carefully toss fruit with honey mixture. Sprinkle with candied walnuts. Serve immediately. *If you don't want to make the candied walnuts you can buy pralined pecans in the nut section of your grocery store. This can be a bit pricey but I have to confess it is my favorite thing to put in the salad. Mix boiling water and jello together for 2 minutes. Mix in frozen oj concentrate until dissolved. Mix in reserved 1 cup mandarin orange and pineapple juice. Add fruit. Put in a 9 x 13 dish and refrigerate until set. Make pudding according to package directions. Pour over set jello and refrigerate for 5 min. Drop whipped topping in several mounds on top of pudding layer and carefully spread. Cook Acini Di Pepe macaroni: Bring 6 cups water to a rapid boil in 3 quart saucepan. Add 2 teaspoons salt. Slowly add 1 cup Acini Di Pepe. Return to rapid boil, stirring to separate. Boil only 2 minutes. Cover and remove from heat. Let stand 6 to 8 minutes. Drain immediately and rinse with cold water to chill. In small saucepan, mix sugar, flour and salt; stir in pineapple juice and egg. Cook over moderate heat, stirring constantly until thickened (or cook in microwave). Add lemon juice, set aside and cool. Stir lightly. Chill at least 1 hour before serving. Combine the apples and chopped candy bars in a bowl. Fold in cool whip. Cook chicken in a slow cooker with 1/4 cup water for about 3 hours. Cover with KC sauce and cook one more hour. Chill, cut. Coat nuts with 3 Tbsp sugar. Mix dressing ingredients (mayonnaise, sugar, vinegar, poppy seeds). Mix all ingredients together and toss with dressing. 2) combine apples, grapes, oranges. Add marshmallows, yogurt and lime zest (do not omit lime zest). Mix gently. Sprinkle nuts over the top. In a large bowl, combine whipped topping, pudding mix and food coloring if desired. Fold in the marshmallows and pineapple. Cover and refrigerate for at least 2 hours. Just before serving, sprinkle with nuts. Yield: 12 servings. Heat 2 tablespoons olive oil in a skillet over medium heat. Stir in rice, and cook until lightly browned. Pour in the water. Bring to a boil, reduce heat to low, and simmer until all liquid has been absorbed. In a large bowl, mix the green beans, olives, red pepper, green pepper, pickle, tomatoes, and garlic. Toss with the rice. Sprinkle with vinegar and remaining 1 tablespoon olive oil, and toss to coat. Cover, and refrigerate 1 hour, or until completely cooled, before serving. Wash and dry 2-3 bunches fresh spinach. 1 small head lettuce chopped, ¾ lb swiss cheese grated, I cup cottage cheese – drained, ½ lb bacon crisp and crumbled. Mix together. Just be for serving mix in refrigerated mixture. Greens with Grilled Chicken, Mandarin Oranges, diced Green Pepper, sliced Green Onion, Cashews and thinly sliced fried wontons and serve with a Citrus Vinaigrette. Throw in some snow peas and water chestnuts if you have them. cucumbers, pineapple chunks, avocado, red onion and pickled beets (I know, but I swear it's good!) w/ catalina dressing. greens with sliced strawberries, red onions, toasted sugared almonds (i make a bunch at a time in a frying pan and keep them in a baggie in the cupboard), hard boiled egg (i leave this out cause I dont like eggs) and a raspberry vinegrette dressing (my favorite brand is Brianna's). greens w/poppy seed dressing and cashews. I also like greens w/ cucumbers, olives, mushrooms w/ ranch dressing. Good seasons has a really good vinegrette that is good and yummy. I think it's called roasted red peppper. I also just had something that was really yummy the other day. Greens w/ cucumber, strawberries, and light house poppy seed dressing. I love this salad at Kneaders--mushrooms, purple onions, craisins, sunflower seeds, turkey, and I think some cheese. They use a raspberry poppy seed dressing. I also love spinach with hard-boiled eggs, bacon bits, mushrooms, grape tomatoes, and parmesan cheese. Any dressing is good!! 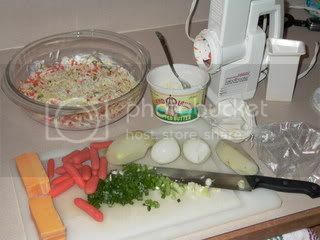 In the summer I had cooked taco meat and make it a very cool and easy meal.. Even my kids will eat this one. You of course could make it healthy with lowfat dressing (or omit it altogether the salsa makes it flavorful) and baked chips. Mix all together and chilled for several hours before serving. I do not know the amounts I just keep adding till it looks right. 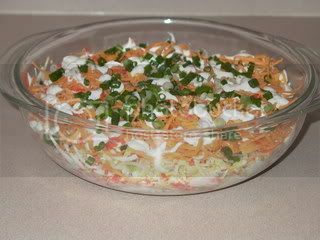 In a large bowl or container, toss with shredded cabbage and other salad mixture ingredients. In a separate, smaller bowl, mix together the dressing ingredients. Pour dressing over salad mixture and toss. Chill overnight! Bring to a soft boil until thick. Mix yogurt (flavor that compliments your fruit) and sweetened condensed milk together - add whatever fruit you want. Chill and it will slightly thicken. Put all the ingredients into a blender. Blend until smooth. have any interesting dressing recipes or fruit dips? Pour over salad mixture! It's delicous! I know you don't want any green salads but I have a recipe that everyone always loves. I apologize in advance if it's not what you want but you can try it another time if it won't work for Saturday. Dressing: (prepare the night before and put in fridge) 1 c. mayo, 1/4 c. sugar, 2 Tbsp. vinegar - apple cider vinegar is best. Salad: 1 pkg. lettuce, 1/2 pkg. baby peas - cooked and cooled, 10 slices provolone cheese - thickly sliced, 1/2 red onion - chopped, bacon - 10 strips cut up. Toss the salad and add dressing right before serving. I've also seen this made with fresh broccoli. cook pasta, al dente, add broccoli last few minutes of cooking time, drain, run with cold water to stop cooking process of pasta and broccoli, drain well, VERY well. Mix with tomatoes, olives, dressing, and right before serving, croutons and parmesan cheese, toss. If like, we have added in past, pepperoni, cubed mozzarella cheese, diced red onion and other veggies on hand. Surprisingly, the croutons are one of the biggest hits, and always have extra parmesan cheese for guests to add. BIG HIT, enjoy! Best if dressing is made several hours in advance and refrigerated. Then mix and enjoy. Place chopped cabbage, broken noodles, onions,and chicken in a bowl. Brown sesame seeds and almonds lightly(not together-sesame seeds will burn). Cool and add to cabbage mixture. Pour dressing over cabbage mixture and refrigerate overnight. Stir before serving. Mix it all together and refrigerate. Make it the day before. I put it in Tupperware and shake it whenever I remember! it is sooo yummy a nice switch from you typical coleslaw. In a large bowl, combine all salad ingredients, exept cilantro sprigs; mix well, In small bowl, combine all dressing ingredients; blen well. Pour over slad; toss to coat. Serve immediately or refrigerate until serving time. Garnish with cilantro. NOTE: When handling jalpeno chiles, wear plastic or rubber gloves to pretect hands. Do not touch your face or eyes. Through everything in the blender and process until smooth. This a favorite at our house and it is SO simple. You dice the Cuke and Tomatoes. Then add the other ingredients. This is even better if it is allowed to set over night in the fridge. Cook the potatoes, carrots, and eggs. Then just slice/grate them into layers. I grate almost everything on a grater (I have one of those six sided ones). Potatoes and carrots on a large side and eggs, cheese, and butter on a fine one. I love how the eggs and butter looks when it is done. Oh, yeah and green onions are thinly cut up. I was out of onions for the party, so if you like them you can put them in, I really do like them. I put the mayo in a ziplock bag and then cut off or should I say snip off the corner, then just squeeze it out. Just don't cut off more than you should, you don't want it to be soaked in mayo. Not a lot of butter, just some bits of it. Enjoy. oh my word this is yummy!!! Thanks for the inspiration. put everything into a ziploc bag and squeeze air out, seal it. cut the pointed corner to dispense the mixture, like piping frosting on a cookie. spread a little Mayo mix into the bottom of bowl. I decided against using butter, even though it shows in the photo. I had everything in my fridge to try this recipe tomorrow. I decided to hurry and make it so the flavors will blend overnight. Eddy had a great idea to use the ziploc bag with cut corner for Mayo mixture. This would make a really yummy casserole too! I made this salad in a Pyrex dish, so I can bake it if my husband doesn't like it cold. I might try this warm with some ham or little smokies cut up in it.